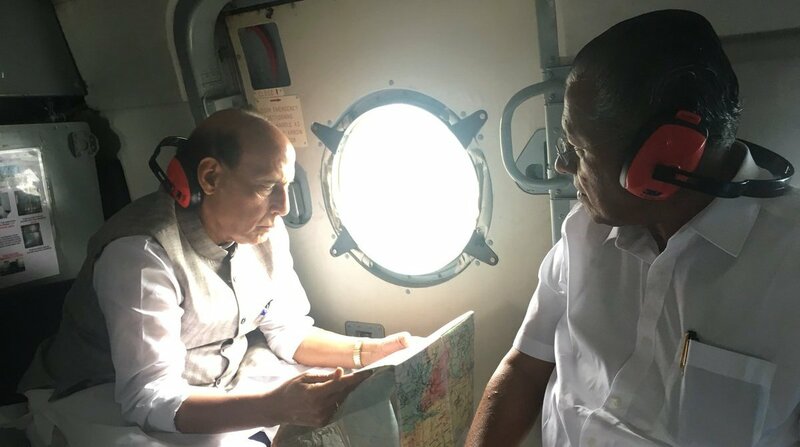 Home Minister Rajnath Singh conducted an aerial survey of flood-hit areas in Kerala on Sunday to take stock of the situation that has affected the southern state. Singh, who arrived in Kochi for a day-long visit to review the situation, was accompanied by Kerala Chief Minister Pinarayi Vijayan and union Minister KJ Alphons during his aerial survey. The Home Minister will also review rescue and relief efforts undertaken by the state government and various central government agencies. Unprecedented rains have severely affected Kerala in the last few days. The worst hit areas in Kerala are Kannur, Wayanad, Kozhikode, Idukki and Mallapuram. While roads have been washed away at many places, dams are struggling with rising levels of water in the catchment areas. Several dams have been opened to release the waters. The CM said on Sunday that 33 people have lost their lives in various rain-related calamities. Six others are missing. “Such destruction has never before been witnessed in the state. The entire state has come together in these circumstances and we are ready to do whatever is necessary. State Police, NDRF, Army and other forces are working with the same motive – to help the people of the state,” he was quoted as saying by ANI. “The PM called us and said that any more help needed, will be provided to us,” the Kerala CM added. 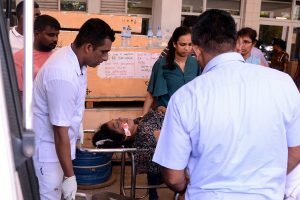 The Centre has been providing assistance to the state for the last few days. Numerous columns of Indian Army, Indian Air Force, Indian Navy and personnel from NDRF are busy providing aid, restoring connectivity, and evacuating affected people to safer areas. A total of more than 1000 people including elderly women and children were rescued from various locations where teams are presently operating. Troops are relentlessly involved in rescue operations fighting bad weather, poor communications and connectivity. In view of possible inundation, additional NDRF teams have been kept on standby in vulnerable locations and are keeping close vigil over the development of situation. The Army on Sunday restored connectivity to Virinjapara village in Mankulam area of Idukki district by constructing a makeshift concrete bridge to help the 800 families residing in the village. A total of 53,501 homeless people are living in 439 relief camps since 8 August. Vijayan had on Saturday announced a compensation of Rs 4 lakh each to all those who lost their homes, while those who had lost both their homes and other properties would get Rs 10 lakh. “Each person put up in relief camps would receive Rs 3,800,” Vijayan said. Singh’s visit comes in the middle of rains in Wayanad and Idukki triggering fresh fears in the people. Reports say that the Centre might send more forces to help the people in distress.